Topping this section is the 1st Ohio Light Artillery Regiment. An appropriate administrative space, then listings for the independent batteries – 1st through 26th. But notice the 13th Battery (which never fully organized, and was broken up in 1862) and the 23rd Battery (which became Simmonds’ Independent Battery and was allocated to Kentucky). 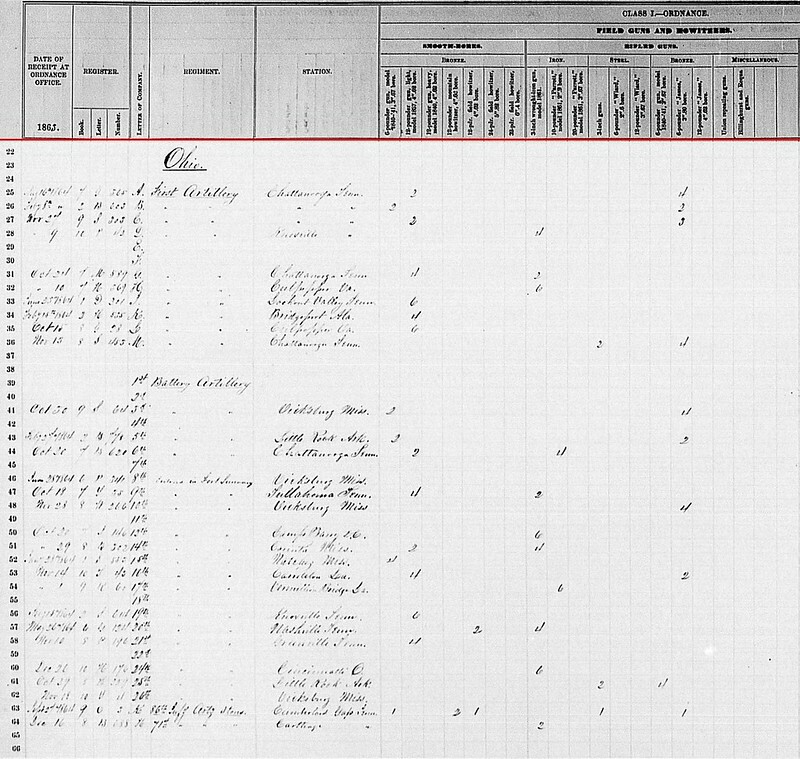 At the bottom of this list are two infantry regiments reporting artillery and stores on hand. Not on this listing is a section of mountain howitzers assigned to the 2nd Ohio Cavalry at this time of the war, which we will discuss. Thus we have an itinerary for the next set of postings on this theme. 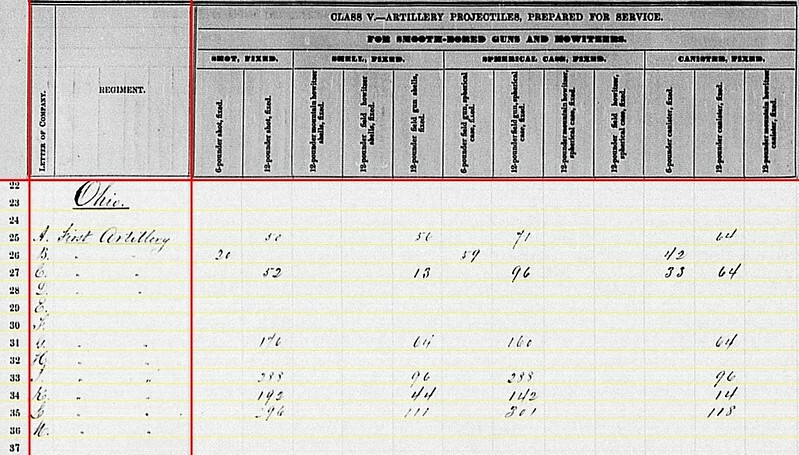 Battery B: Also reporting at Chattanooga, with two 6-pdr field guns and two 3.80-inch James Rifles. The battery remained in Second Division, Twenty-First Corps and Captain William E. Standart served as division chief of artillery. In his place, Lieutenant Norman A. Baldwin commanded the battery. On September 19, the battery fired 159 rounds. On September 20, they occupied a position behind breastworks in the heart of Thomas’s line (what is today Battleline Road). Fighting in their sector began at 8 a.m. And the battery only relinquished those works when ordered to the rear around 5 p.m., having fired 986 rounds (pretty much all they had coming into action). Three of the James rifles were disabled in the fighting. Only one could be recovered back to Chattanooga. The battery lost thirteen horses; one man killed, eight wounded, and four missing. Battery C: Reporting at Chattanooga with two 12-pdr Napoleons and three 3.80-inch James Rifles. Captain Daniel K. Southwick commanded the battery at the start of the quarter. However he resigned (officially dated to October 19). Lieutenant Marco B. Gary led the battery as they marched with Third Division, Fourteenth Corps toward Chickamauga Creek. The battery was in action both days of the battle. As it was often employed by section, Lieutenants Hiram W. Turner, Thomas King, and Jerome B. Stevens are listed on the battery’s War Department tablets. Caught up in the confusion in the afternoon of September 20, Gary took it upon himself to move the battery to the rear. Having lost 25 horses already, this was a daunting task even without Confederate pressure. 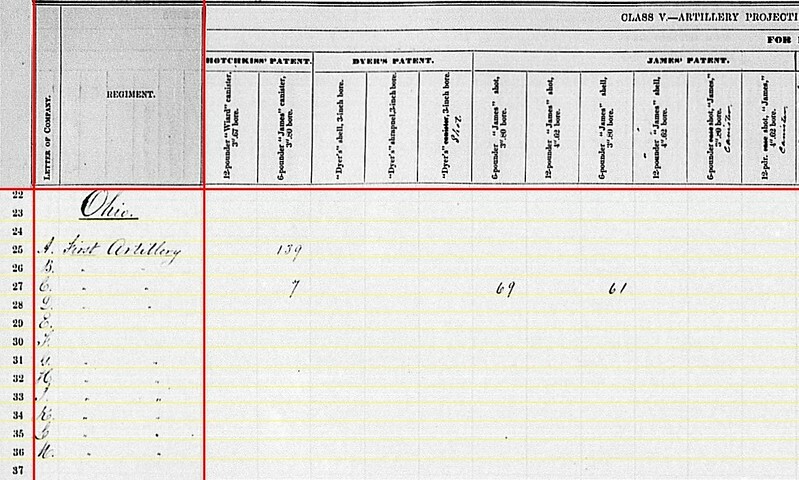 Gary reported losing one James rifle, one caisson, and parts of two other caissons. All told the battery expended 498 rounds in the battle. Battery D: At Knoxville, Tennessee with four 3-inch Ordnance rifles. At the end of the previous quarter, the battery was serving by section in support of different cavalry divisions. In July, the battery was consolidated, in eastern Tennessee, and transferred to the First Division, Twenty-third Corps. Captain Andrew J. Konkle (or Conkle on some returns) commanded. By August, the battery was again transferred. This time to the Third Division of the same corps. Lieutenant William H. Pease commanded when Konkle took command of the corps reserve artillery. Battery E: No report. This battery was assigned to Second Division, Reserve Corps, part of the Nashville garrison when the quarter began. Lieutenant Stephen W. Dorsey remained in command of the battery. Later in July, the battery moved forward to Chattanooga, reaching Bridgeport in October. Captain Warren P. Edgarton, of the battery, was in command of the Nashville garrison artillery. Battery F: No report. Captain Daniel T. Cockerill was still recovering from wounds. His immediate replacement, Lieutenant Norval Osborn, was later replaced (due to date of rank) by Lieutenant Giles J. Cockerill. The battery was assigned to Second Division, Twenty-first Corps. The battery had four James rifles and two 12-pdr field howitzers. Leaving the field on September 20, the battery had only fifteen rounds left in their chests. Battery G: At Chattanooga, Tennessee with four 12-pdr Napoleons and two 3-inch Ordnance Rifles. Captain Alexander Marshall’s battery assigned to Second Division, Fourteenth Corps. In action at Chickamauga, the battery fired 294 rounds. Battery H: Reporting at Culpeper, Virginia with six 3-inch Ordnance Rifles. Captain James F. Huntington resumed command duties during the summer. The battery Transferred to the 4th Volunteer Brigade, Artillery Reserve, Army of the Potomac in August. Battery I: In Lookout Valley, Tennessee, based on a January 1864 receipt date, with six 12-pdr Napoleons. Captain Hubert Dilger’s battery was assigned to Eleventh Corps. The battery was sent west, with the rest of Eleventh Corps, to reinforce Chattanooga, with movement starting in late September. Battery K: Bridgeport, Alabama, with four 12-pdr Napoleons. Part of the Eleventh Corps, along with Battery I, this battery moved to reinforce Chattanooga in late September. Captain Lewis Heckman remained in command of the battery. But in his absence Lieutenants Columbus Rodamour led the battery. Later, in Tennessee, Lieutenant Nicholas Sahm, of Company I, 1st New York Artillery, led the battery in operations around Chattanooga. Battery L: At Culpeper, Virginia with six 12-pdr Napoleons. Captain Frank C. Gibbs had command of this battery, supporting Fifth Corps. Battery M: Chattanooga, Tennessee with two 3-inch rifles and four 3.80-inch James rifles. Captain Frederick Schultz commanded this battery, assigned to Second Division, Fourteenth Corps. 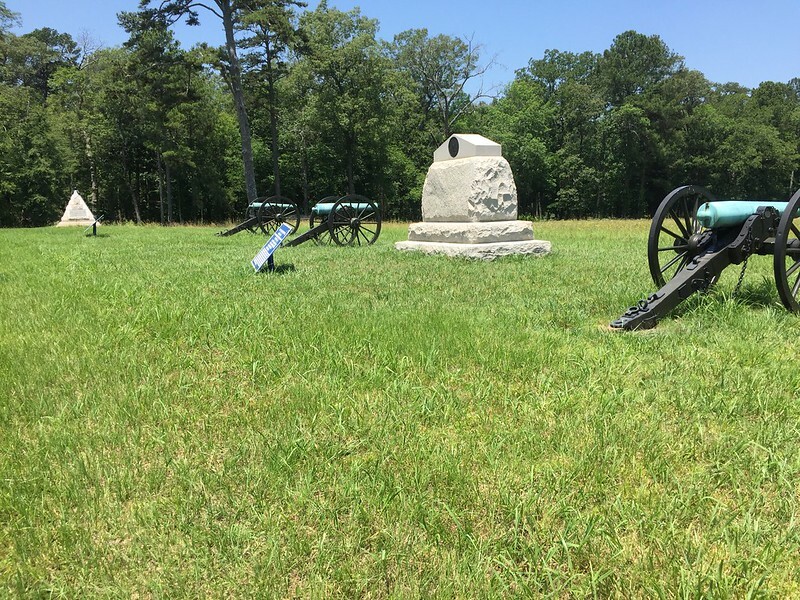 At Chickamauga, the battery fired 415 rounds. Battery A: 50 shot, 56 shell, 71 case, and 64 canister for 12-pdr napoleons. Battery B: 20 shot, 59 case, and 42 canister for 6-pdr field guns. Battery C: 52 shot, 13 shell, 96 case, and 64 canister for 12-pdr Napoleons; but also 33 canister for 6-pdr field guns (which may have been used in the battery’s James rifles). Battery G: 176 shot, 64 shell, 160 case, and 64 canister for 12-pdr Napoleons. Battery K: 192 shot, 44 shell, 142 case, and 14 canister for 12-pdr Napoleons. Battery L: 296 shot, 111 shell, 301 case, and 118 canister for 12-pdr Napoleons. Battery A: 86 shot for 3.80-inch James. Battery C: 55 percussion shell for 3.80-inch James. Battery D: 161 canister, 238 percussion shell, and 460 fuse shell for 3-inch rifles. Battery G: 77 canister, 175 percussion shell, and 120 fuse shell for 3-inch rifles. Battery H: 339 shot, 92 canister, and 27 fuse shell for 3-inch rifles. Battery M: 127 canister, 75 percussion shell, 98 fuse shell, and 99 bullet shell for 3-inch rifles; and 63 shot for 3.80-inch James rifles. The report of over fifty 3-inch shot per gun in Battery H is worth noting. No conclusions to draw. But that is a significant deviation from normal allocations. Battery A: 139 canister for 3.80-inch James rifles. Battery C: 7 canister for 3.80-inch James rifles. Battery C: 69 shot and 61 shell for 3.80-inch James rifles. Battery A: 186 shell for 3.80-inch James rifles. Battery B: 70 shot and 210 shell for 3.80-inch James rifles. Battery C: 2010 shell for 3.80-inch James rifles. Battery H: 729 shell and 40 case for 3-inch rifles. Battery A: Seven horse artillery sabers. Battery B: Eighteen horse artillery sabers. Battery C: Six horse artillery sabers. Battery D: Twenty-eight navy revolvers and thirty horse artillery sabers. Battery G: Six army revolvers and ten cavalry sabers. Battery H: Twenty army revolvers and thirty horse artillery sabers. Battery I: Nine army revolvers and thirty-nine horse artillery sabers. Battery K: Five army revolvers and five horse artillery sabers. Battery L: Nineteen navy revolvers and thirty-three horse artillery sabers. Battery M: Six army revolvers and six cavalry sabers. The small arms totals might look thin. 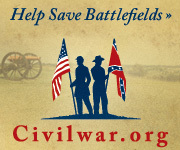 And one might think those due to losses at Chickamauga. 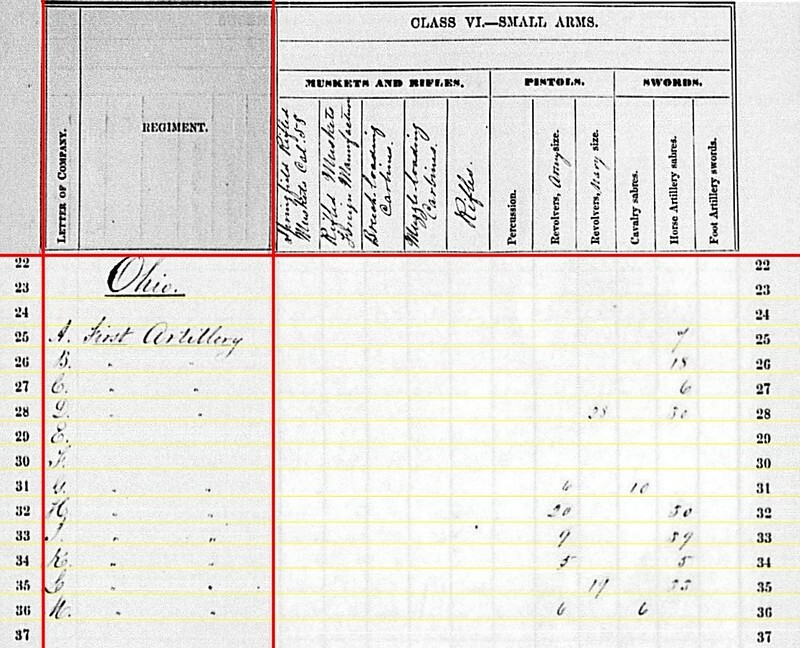 Though there were small arms lost in the battle, and reflecting in the totals on the summary, the 1st Ohio batteries did not carry many into the quarter. And thus didn’t go into action on September 19 with an abundance of edged weapons and pistols. Given the close quarters at which some of the fighting took place in that battle, the scarcity of small arms is an important interpretive factor, I feel. next installment will look at the first twelve independent batteries of Ohio.